Hi, everyone! Get the behind-the-scenes history of my post-apocalyptic novel, The Last of the Ageless. Let me know what you think in the comments! The Last of the Ageless: One-Year Anniversary! One year ago tomorrow, I published The Last of the Ageless (as an ebook). I underestimated how much time I would need to not only format the paperback, but also print and ship the proofs to myself (third time was the charm! ), so the paperback came out later in August. Now that I’m one year into my publishing journey, it seemed like a good time to reflect. Because this post will be long, I’ve decided to break it into two THREE parts. Part 1 covers most of Friday and parts of Saturday. Part 2 contains notes from panels on planning a trilogy, marketing, and how to end your story. And Part 3 will be my own reflections. When Calandra Usher invited me to the reading and then reminded me it was at 9 pm Friday, I got the jitters. But Cali is awesome and she helped me pick the right scene for the reading! I’ve only done one public reading before at my old high school. So this was pretty exciting for me, and what I hope is a taste of things to come. Each member of the Broad Universe went down the line and read 3 minutes’ worth of goodness from their latest work in progress or published novel. And when my turn came, I don’t think I tripped over a single word. Or if I did, I probably skipped it. Everyone had something awesome to read. Next year we’re going to provide a list of works or pass around some sort of mailing list so people can find the stories they liked best. I was just super stoked to see my name on a piece of paper with all of these fine folks. Big thanks to the Ardent Alliance for supporting my writing career and giving me the funding for membership with the Broad Universe! The Broad Universe is an organization dedicated to the support of female science fiction, fantasy, and horror writers. 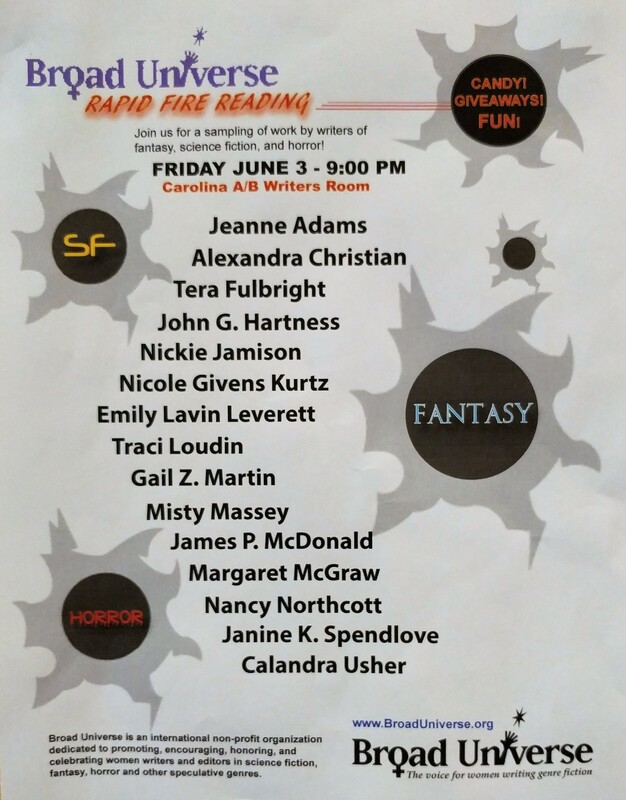 That doesn’t mean Broad Universe is strictly limited to female membership, however, and in fact we had male-identifying authors read on Friday. All speculative fiction authors who uphold the Universe’s mission can join. See the FAQs.